Without a doubt, the biggest news in the sportbike scene for 2018 is Ducati’s Panigale V4 and the emergence of a mass-produced four cylinder engine – the Stradale V4. While Ducati has finally left its beloved V-Twin engine behind (at least in terms of superbikes), there was no way the folks in Borgo Panigale would conform to tradition when it came to its new four-banger. For starters, as the name implies, the new engine is arranged as a 90º V4 – essentially multiplying its V-Twin tradition by two. The similarities don’t end there, though: the V4 is arranged with a “Twin Pulse” firing order, meaning each bank of cylinders fires closely together. The end result is a four cylinder that sounds awfully similar to Ducati’s traditional V-Twin (or L-Twin for the Ducatisti who will inevitably whine about the improper nomenclature) until revs start to climb to the Stradale’s 14,500 rpm redline. Then the Stradale roars like nothing else out there. To get a deeper understanding of what Ducati did to the Stradale engine, check out Kevin Duke’s First Ride Review. The Ducati Stradale V4 in the foreground, with the MotoGP V4 behind it. For a production engine, and a flagship sportbike engine at that, the Stradale V4 features incredible technology and a claimed power output to match. With an 81mm bore (likely to conform to World Superbike rules mandating bore size) and 53.5mm stroke, the Panigale V4 comes in at 1103cc – clearly, and blatantly, well above the 999cc limit for the rest of its four cylinder competition and the WSBK rulebook. To be clear, however, a 999cc version – the Panigale V4 R its likely name – is currently being developed for racing use starting in 2019. When all is said and done, Ducati claims the Stradale V4 makes 214 hp and 91.1 lb-ft of torque to the crankshaft. Naturally, when talking of Ducati’s V4, another Italian has to enter the conversation: The Aprilia RSV4. Heavily upgraded in 2015, the most notable improvement – at least in terms of this particular story – is a 16 hp bump, resulting in a claimed 201 hp at the crank. To know exactly how Aprilia achieved this, a revisit to Kevin Duke’s First Ride of the RSV4 is in order. The changes are numerous and significant, with revisions and improvements in several little areas adding up to one big result – more power. In contrast to the Ducati Stradale V4, Aprilia’s RSV4 engine has essentially been going strong for the past decade. Ten years is an eternity in the sportbike scene, but Aprilia have continually revised and improved the V4 to match, or better, its rivals. However, with its displacement deficit the RSV4 engine doesn’t stand much of a chance against the Ducati. 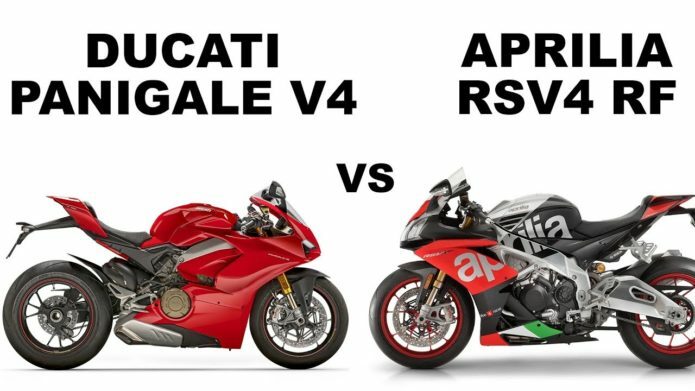 It shouldn’t be any surprise, really, to see the Ducati – with its displacement advantage – not only makes more peak power than the Aprilia, but also out-muscles the RSV4 throughout the entire rev range. Sure we were a little surprised to see relatively low numbers from both bikes (especially since we have seen the 2015 RSV4 RF and Ducati 1299 Panigale S pump out 175.8 hp and 175.0 hp, respectively, in the past), but this goes to show the difference between different dynos on different days. Comparing apples to apples, what’s important in this particular dyno chart is how each bike compares to the other. Besides the obvious power advantage from the Ducati, what’s impressive is the nearly smooth power curves from both bikes. This indicates fairly sorted fuel injection mapping straight from the factory, which should translate to excellent power delivery and communication between the rider’s wrist and the rear tire. Of course, there’s always room for improvement, and both bikes fall flat at the end of their respective rev ranges. The guys at Motorsport Exotica tell us an ECU reflash takes care of the dip seen at the end of the Aprilia’s graph (and then some), while they’re certain the same will hold true once someone’s able to crack through the Panigale’s brain. Or, if you are the impatient type, opting for the V4 Speciale will also get you an Akrapovic pipe, which is claimed to bump power to 226 hp! At full song, the Ducati Panigale V4 S was simply too much for the mic on my phone. However, you still get the point. Unfortunately, we missed our opportunity to to get the same footage for the Aprilia. Drooling yet? You should be. We live in the golden age for sportbike technology, and both the Aprilia RSV4 RF and Ducati Panigale V4 S are proof. On the dyno, the Ducati showed its dominance by virtue of its larger displacement, but as we all know by now, putting up big numbers on the dyno doesn’t necessarily make a good motorcycle.